Finally! After two years finally a new album from the secret favorite band "Mando Diao". The disk presents a whole new look and feel, quite different from the previous releases. Fresh and retro at the same time. Hmm... at first there isn't much left of the "old" Mando Diao. You still recognize it as MD but with this release their very experimental and intruduce many new style elements. First of all is the obvious retro style. Some tracks sound like 70's Disco, some even older - feeling like one of this good old "detective movies". Second point: the drums and bass parts are very impressive, flowing and very present. The guitar is most time a "simple" background rhythm guitar which supports. Very unsual for Mando Diao till today. They are also using a piano in many tracks. 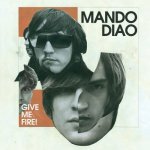 At my perspective a great new album from Mando Diao. Plus: I don't have the feeling that the disk contains only two good tracks and the rest is filler material like the last releases. Ears 8/10 - Great "as usual". Liked it. Development 9/10 - I like the new ideas and style, keep it up!